You know how every state has its own official bird, motto, and more? Some states have taken it even further and designated unofficial foods and songs too. But what about cars? 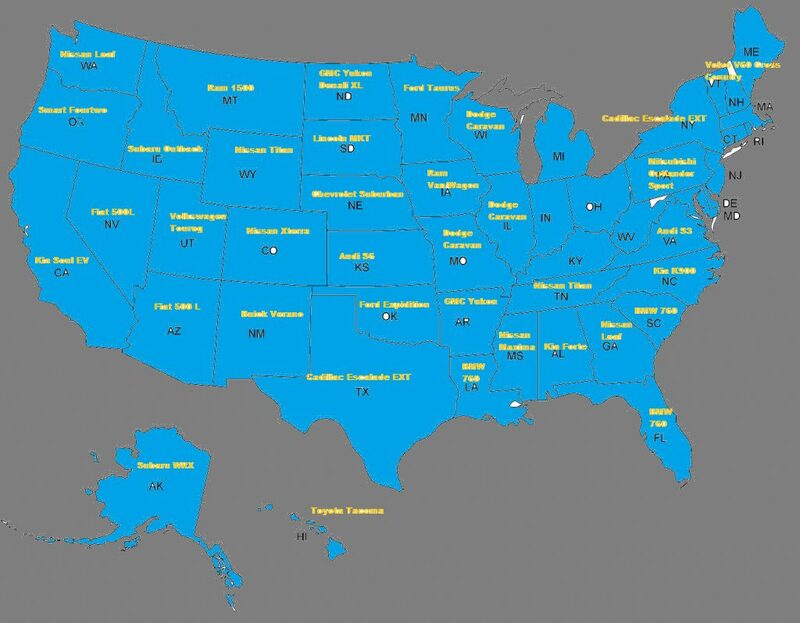 Which car is the most distinctive in each state, the one that truly represents that one 1/50th portion of the US? Which make and model sells better in one state, rather than another? Let’s find out! Tom Libby of IHS Automotive recently helped Popular Mechanics and Esquire magazine to crunch the numbers and pulled data about the make and model of every car sold in the U.S., and calculated the popularity of each by percentage using registration data. Then, he did the same at the state level, and compared each state to the national average. Alabama: The Kia Forte which sells at 286 percent of the national average. Alaska: the Subaru WRX sells at 341 percent of the U.S. average. It’s a Subaru-dominated state with the Outback, XV Crosstrek and Forester all having market shares in Alaska more than twice the U.S. average. Arizona: Fiats are a big hit here with both the Fiat 500L (which sells at 238 percent of the national average) and the Fiat 500 (selling at 1.7 times the national average). Arkansas: GMC models in general are extremely popular in the “Diamond State” with the GMC Yukon selling at 407 percent the national average. California: Kia Soul EV (which is only available in a few select states) has been adopted by the west coast’s largest state. Electric vehicles in general are popular in California thanks to the state’s Zero Emission Vehicle mandate, with the BMW i3 and Tesla Model S having California market shares more than three times their national averages. Colorado: The Nissan Xterra sells at 524 percent the national average, while six Subaru models. including the Impreza, XV Crosstrek, Outback, Legacy, WRX and Forester all have market shares more than twice their national averages in the Rocky Mountain State, noting a similar taste with Alaska. Connecticut: Subaru Imprezas sell at 441 percent the national average. The runner up would be five Volvo models, including the XC70, V60 Cross Country, S80, S60 and XC60, who all have market shares in Connecticut more than twice their national averages. Delaware: The Volvo S80 sells at 345 percent the national average and at the same time the Aston Martin Vantage’s market share in Delaware is more than two and a half times its U.S. market share. District of Columbia: We joke about our tax dollars going to the frivolous spending on Capital Hill, but it’s kind of hard not to especially when the Jaguar XK sells at 752 percent the national average. Four premium vehicles, including the Jaguar XK, Aston Martin Vantage, Ferrari F12 Berlinetta and Jaguar XJ, all have market shares in the District of Columbia more than six times their national averages. Florida: Tease Florida all you want, they have great taste in cars with the BMW 760 selling at 623 percent the national average. Three Rolls Royce models, including the Phantom, Ghost and Wraith, all have market shares in Florida more than three times their national averages. Georgia: The state know for their peaches also has a thing for the Nissan Leaf which sells at 1,523 percent the national average, thanks in part to the (recently discontinued) $5,000 state tax credit towards the purchase of an electric vehicle. Hawaii: Say hello and goodbye with Hawaii’s car the Toyota Tacoma, which sells at 718 percent of the national average. Idaho: The Subaru Outback sells at 275 percent of the national average. Illinois: The Dodge Caravan sells at 291 percent of the national average, while the Mitsubishi Outlander and Outlander Sport each have market shares more than twice their national market shares. Indiana: The Buick Encore sells at 249 percent of the national average. Iowa: Ram trucks sells at 384 percent of the national average. Iowa loves its domestic vehicles: The twenty-six models in Iowa with the highest market shares, when compared to their national market shares, are all made by domestic manufacturers. Kansas: the Audi S6 sells at 243 percent of the national average. In Kansas the Porsche 918 also sells at more than twice its national rate—though there are only 190 Porsche 918s in the entire U.S.
Kentucky: Kia Rio sells at 229 percent of the national average. Louisiana: Like their music and food, Louisiana likes a jazzy cool in their cars, the BMW 760 sells at 854 percent of the national average. Maine: Volvo V60 Cross Country sells at 554 percent of the national average. In addition, five Subaru models, including the Impreza, Forester, XV Crosstrek, Outback and Legacy, all have market shares more than twice their national market shares. Maryland: Though known for being the New England spot for Crab Cakes, the MINI Clubman sells at 383 percent of the national average. Massachusetts: The Volvo XC70 sells at 305 percent the national average. Another four Volvo models, the V60 Cross Country, S80, XC90 and XC60, each have market shares equal to more than twice their national market shares. Michigan: The Lincoln MKS sells 631 percent of the national average. Minnesota: The Ford Taurus sells at 271 percent of the national average. In addition, the Chevrolet Silverado and Ford F-Series each have market shares more than one and a half times their national shares. Mississippi: the Nissan Maxima sells at 484 percent of the national average. In Mississippi three Nissan models, including the Maxima, Titan, and Armada, each have market shares more than four times their national averages. Missouri: the Dodge Caravan sells at 208 percent of the national average in the “show-me” state. Montana: The Ram 1500 sells at 397 percent of the national average. More surprisingly is that three exotic models, including the Ferrari F12 Berlinetta, Porsche 918 and Aston Martin Vanquish, sell at more than five times their national averages, with the Ferrari selling at more than nine times its national average. Probably due to Montana levying no sales tax, also allowing owners to form LLCs and register their supercar in Montana, even if their main residence is in another state. ? Nebraska: the Chevrolet Suburban sells at 260 percent of the national average. In Nebraska the Chevrolet Silverado and Ram 1500 each sell at a rate more than twice their respective national averages. Nevada: the Fiat 500L sells at 388 percent of the national average. In Nevada the Rolls Royce Wraith and Bentley Mulsanne and Continental each sell at more than twice their national rates. New Hampshire: the Volvo V60 Cross Country sells at 597 percent of the national average. New Jersey: The crew from the shore probably loves their Audis. Audi S6 sells at 260 percent of the national average. In New Jersey six Audi models, including the S6, A4, A6, A5, A3 and Q7, each sell at a rate more than twice their respective national averages. New Mexico: The Buick Verano sells at 415 percent of the national average. In addition, three Nissan models, including the Cube, Titan and Xterra, each have market shares more than twice their national averages. New York: Not just the big apple but the whole state itself loves the Cadillac Escalade EXT, which sells at 502 percent of the national average. Ohio: the Chevrolet Cruze sells at 201 percent of the national average. In Ohio the Chevrolet Avalanche, Cruze and Equinox each sell at a rate of about twice the national average. Oklahoma: the Ford Expedition sells at 266 percent of the national average. In Oklahoma four large pickups sells at Titan, Silverado, Ram and F-Series sells at each sells at a rate more than twice its national average . Oregon: Could Portland hipsters be influencing the whole state? Green is in with the Smart Fortwo selling at 462 percent of the national average. In Oregon three sub-compact cars, including the Smart Fortwo, Mercedes-Benz B-Class and Chevrolet Spark, each sell at a rate more than three times the national average. Pennsylvania: The Keystone state seems to be a fan of the Mitsubishi Outlander Sport, which sells at 298 percent of the national average. Rhode Island: The Hyundai Elantra Coupe sells at 452 percent of the national average. In Rhode Island four Volvo models, including the V60 Cross Country, XC70, S60 and XC60, all sell at a rate more than twice their national averages. South Carolina: Home to the US BMW manufacturing plant, the BMW 760 sells at 935 percent of the national average.? South Dakota: the Lincoln MKT sells at 641 percent of the national average. In South Dakota the Aston Martin DB9 and Vanquish each have market shares more than five times their respective national averages. Tennessee: Where the Smyrna Nissan plant builds several models, the Nissan Titan sells at 337 percent of the national average. In Tennessee nine Nissan or Infiniti models sell at more than twice their national rates. Texas: Would Texans mind having something in common with NY? The Cadillac Escalade EXT sells at 343 percent of the national average. Meanwhile, Texas, known for large vehicles, the sub-compact Mazda2’s market share is more than three times its national average. Utah: The Volkswagen Touareg sells at 366 percent of the national average. Vermont: “V” for Vermont and also…Volvo? The Volvo V60 Cross Country sells at 841 percent of the national average. In Vermont three Volvo models, including the V60 Cross Country, XC70 and S80, each sell at a rate more than four times their respective national averages. Virginia: The Audi S3 sells at 343 percent of the national average. In Virginia the five models with the highest market shares, when compared to their national market shares, are all luxury models, including the Lexus IS-F, Audi S3, Volvo XC90, Acura TL and Volvo XC70. Washington: Much like it’s neighbors, Ca and Po, green is in. The Nissan Leaf sells at 407 percent of the national average. In addition, three electric vehicles, including the Nissan Leaf, BMW i3 and Tesla Model S, each sell at a rate more than twice their national rates. This is likely because in Washington, all electric vehicles are exempt from state motor vehicle sales tax and use tax. West Virginia: The Mitsubishi Outlander Sport sells at 403 percent of the national average. Wisconsin: the Dodge Caravan sells at 388 percent of the national average. In addition, the Rolls Royce Phantom sells at more than twice the rate it sells nationally. Wyoming: The Nissan Titan sells at 476 percent of the national average. The Nissan Titan and Ram 1500 each have market shares more than four times their national market shares in Wyoming. While each driver will prefer their own style, make, and model of vehicle, there is definitely some surprising statistics above that would suggest you will see a lot more of that make and model than you might see somewhere else. What do you think? Do you believe the car chosen accurately represents your state? Let us know in the comments section below, and check back for more auto articles from Shoptalk powered by Endurance!